In my last post, I discussed how you can see how much money you are leaving on the table when it comes to the online shopping cart. While I still have the shopping cart on my mind, I thought I would follow this up with a concept I call Product Pathing. Product Pathing answers one of the questions I get from time to time: How can I see the order in which website visitors are looking at my products or product categories? The following will provide details on why you might want to do this and its implementation. There may be more reasons, but the preceding items should help you build a case for implementing this, especially since it is not difficult to do. On all Product View Pages, in addition to setting a Product View Success Event and the Products Variable, pass the Product Name (or ID if that is all you have) to a new “Product” Traffic Variable (sProp). Be sure that you pass nothing but the Product Name (or ID) to this sProp. Is it possible to create pathways on a more macro basis? 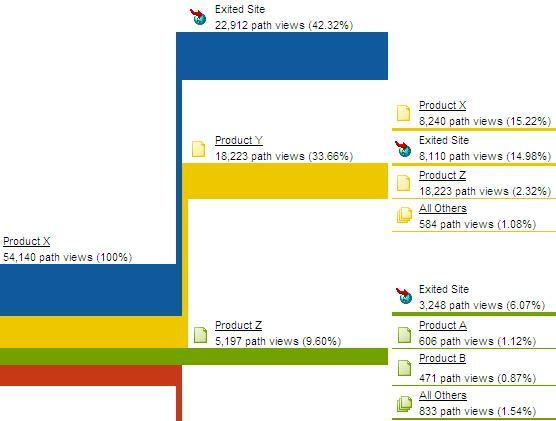 Although this is a great solution, I am more interested in tracking a user’s overall path through the site. I would be more interested in seeing where they went after viewing a product page, not which product page they viewed. Is it possible to create a more macro look at my user’s paths?